My father Louis Kruh, served in the 94th infantry in WWII—he was awarded several medals—I don’t know if I have all of them, and sadly he has memory issues and cannot tell us about how he earned these medals—I can tell you that He has a bonze star(part of it) and a purple heart, and I have a nazi belt on my desk. How can I get the rest of his medals, and how can I get a copy of the orders issuing these medals?? I am very proud of him and want very much to learn more about his heroism. Would you be so kind as to provide me with the name of the ship(s) that returned the 94th Infantry Division to the USA, February 6, 1946? Ernest Martin is a neighbor of ours in rural central Virginia. He has lost his hearing but has the most incredible memory and has amazing tales about his experiences in the war. I would like to connect him with anyone from that company. Please contact me if you know of anyone who might know him. My father-in-law was in the 94th regiment, D+30 through late 1945 in Europe. My husband is looking for a book he had as a child that told the history of the 94th as they travelled across France. His father drove a supply truck. I do not know the name of the book, but am told it had numerous pictures in it. If anyone has any ideas about this, I’d appreciate knowing a title and author so I can search for the book. My grandfather, William Frank Smith, was in HQ Co 2nd bat 301 Infantry during WWII. He passed away in 1975. Does anyone remember my grandfather? He was from Buford, GA. Prior to being drafted by the army he was supposed to play for St. Louis Cardinal’s as a pitcher. He would not talk about his experiences in the war with my father and my father knows little about his unit. Any help would be greatly appreciated. There is a message on your site on 1/4/2009 from a Craig Kubiklan. In the message, Craig is asking for a unit photo of D/376. This brings up an urgent request. Somewhere in the realm of all of the posted measages over the years, are many WWII veterans who have copies of their unit hotos that they could share with your website. Before all are gone and the photos just go to the wind, why not make a mass plea/appeal to your readers to get these unit photos loaded onto your site. After years of contacts, A vet of F/317 provided me with a partial photo of that company (probably at Camp McCain). It clearly shows my Uncle who later died at Bannholz Woods on 2-10-45. Time is of the essence here for collecting these photos. WWII vets are passing away at alarming rates as they age past 80 yrs. There is not much time to save this great part of WWII history, "their faces". Save their faces now before it is too late! Please make an appeal and then make the photo gallery of units a part of your homepage so it can be selected just like the list of "94th WWII war deaths", etc.. Give this some thought and with a mass plea, I think you will get these unit photos before it is too late. Nephew of James E. Graham of F/376/94 who died in Germany 2/10/1945. My uncle, Thomas Bernard McDonnell, served under General Patton, while in the 94th while in Czecoslovakia.He passed away in 1992 and once I recall seeing a photo of him receiving the Silver Star from Patton. Does anyone remember Thomas McDonnell ? My uncle was from Lyndhurst, NJ? My uncle never shared his war stories but I recall that his unit was ambushed. Uncle Bernie was able to get away and secure a tank at which time he killed some 50+ Germans. I don't know what happened to the photo or to his war metal. My father and everyone is deceased. It would be nice to get some information about my war hero Uncle. My name is Vanessa Kane, my father - Kennedy K. Kane #37 243 659 Cn Co 376th Inf. 94th Division. From Pleasant Hill Missouri. He served from 1942 to 1945 and left the service as a Tech 5. My dad passed away in 1996. I have all of his original induction and release papers including a thank you letter from President Harry Truman. I have a copy of a photograph of what I believe is his company (apprx 100 soldiers) in a panoramic size. As well, I have many, photographs of his time in the service, most of which have no notations as to who is in the photograph. I would love to know if there is still anyone around who remembers my dad and would be happy to share photos. You may reach me at the following address/phone number. I work for the Veterans of Foreign Wars in Kansas City MO. My name is Major Tony Crawford and I am trying to track down information on my grandfather. Like many WWII veterans he never spoke of his experiences and passed away in 1982 when I was very young. I was told for years that my grandfather had served with the 95th, but now after discovering some old photos at my gandmother's home I now know he served with the 94th Infantry Division. In the photo he is wearing the distinctive 94th helmet with three other US soldiers and a captured Wermacht soldier. I would like to learn more about his service and "fill in the gaps". Is there a database or resource anyone can point me towards that could tell me more specifics such as company, regiment etc...? Eulane Crawford and in the photos he is a PFC. 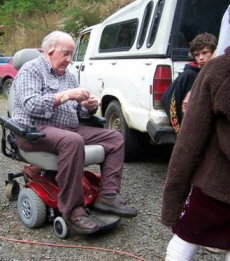 Clinton Bland sharing stories with the family in August. He recently celebrated his 91st birthday and wondered if any of the 302nd F Co. were still hanging in there with him. From: "Rhea, Trenton L SSG RES USAR USARC"
My name is Trent Rhea and I am looking for any information that anyone may have on my grandfather, PFC Harold L. Rhea. He was a member of the Communications Platoon, HQ Company, 3rd Battalion, 301st Infantry Regiment, 94th Infantry Division. Thank you very much for any help you can give me. I am trying to find information on my grandfathers service with the 94th during WWII. His name is William E. Petersen and I believe he was a Tech Sergeant. I know he was with the 301st Field Artillery Company. I have been unable to find any information online and cannot seem to find anything on the 301st Cannon Co. If there is anything you can tell me or somewhere I can go to find out information it would be greatly appreciated. Thank you. I just tried without success to contact Lisa Abke who had posted a message at this site Oct. 13, 2008 asking about anyone else who was a 94th infantry, Company B, WWII P.O.W. My message to her bounced; guess the address is outdated. Maybe she will see this. My Dad, Charles (Chuck) Bondie, was with the 94th in WWII-- the 301st Infantry, Company B. Like Ms. Abke's grandfather, he also was taken prisoner after the commanding officer surrendered company B near Orsholz , Germany on Jan. 21, 1945 and ended up at a POW camp in/near Fallingbostel, Germany. Prisoners there were freed on April 25, 1945. At my request, and also to give the story to his grandkids for a school project a number of years ago, Dad has written a little bit about his experiences from the time he entered the war until taken prisoner, but will say little about his captivity except in rather general terms. I have been wondering how many other members of the 94th's former POWs still are living, and used Google to find this website. Interestingly, there is one other resident in the same facility as Dad who also is a Detroit native and who served in the European Theater during the war, though with a different outfit and never was captured. He & my dad seem to have hit it off as friends and recently they went together to an honoring ceremony for veterans held here in town. If there are any other people out there with stories to share relating to the same time frame & circumstances, please write. My name is Jason Burt and I am trying to confirm some information on my great uncle Cpl. Don Keith Paris. I believe he was part of the 94th division because he has a letter addressed from Company F of the 376th infantry regiment; he also was a medic. From: "Scott & Sherry Bell"
Seeking WWII soldiers or family members who were members of 94th Army Infantry Division, Co. C, 319th Engineers, Combat Battalion. I would like to make connections for my Dad, Leonard Earl Bennett from North Carolina who will be 87 years old 09/23/09. I also can email photos from my Dad's album to anyone interested. For a list of the men in this photo album from Company C, email me at sasca@triad.rr.com. From: "Mike & Marie D'Augelli"
Looking for my F/376 Buddy Pvt Stegel from the Bronx. Have not seen or heard from him since leaving the company December 1945. Hope someone knows or knows what happened to him. I am looking for information in regards to any one who might have known by father: Peter Anthony Zagaglia, Sargent in the 94th Signal Battalion. He was boot camp at Fort Dix, NJ and released from Fort Monmoth, NJ. He came from Newport, RI and served in the army 1942-1945, European theater. He was in the signal corp,. He built the telephone lines during the war. I remember going to a reunion, when I was 11 years in Akron, Ohio. If you could find out some information or lead me in the right direction, I would certainly appreciate it. He passed away in 1968 leaving 4 daughters. Carl Thomas Potter of (company M 376 inf. reg. 94th inf. division) was captured around Metz on Jan 16 1945. I am searching for anyone who has any information or contacts for the above. My father served in the 94th division of the U.S. Army. He's 83 years old now and I think it would be awesome for him to find some of his mates are still alive. Please respond either way. I can be reached at hvizdosfamily@verizon.com or at 412-721-0641. I am looking for anyone who might have information on a relative who fought in World War 2 in this division. His name was Glenn Victor Pugh. 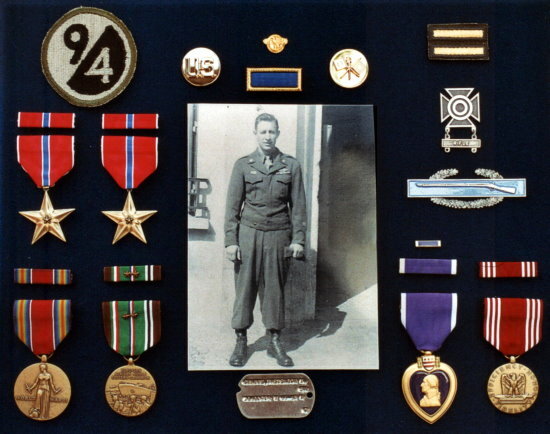 He was a Staff Sergeant in K-Company, 301st Regiment, 94th Division, 3rd Army. His date of death is listed as January 28, 1945. Do any of you have any idea of where he might have died on that particular day? I am also wondering if the data of death is accurate. So many men lost their lives during the Battle of the Bulge and I am wondering if it was possible to always keep those dates accurate. My father, Vernon B. Fox, Jr. was in the 94th, M/376. He passed away in 2002 and is recorded on the TAPS page. Recently, I obtained an inexpensive scanner and have been scanning a few of dad's pictures from the war with other soldiers depicted in them. Few are marked as to who these soldiers are, but there is one photo marked Pop Everson and Homer Greer. Would like to make contact with these soldiers or their families to share with them the picture and perhaps they might have a photo of my dad. Who are we? Visit our website at www.kitchentablegang.org for details about us and what we are doing to help veterans and our soldiers overseas, plus giving proper respect for ol'glory. Every time I drive between my house in Chicago and my Mom's house in Detroit, I pass over the 94th Infantry Highway and wonder if someone, anyone is interested in my Father's old uniform. Dad was in the 94th in the Anti-tank? and was captured in Jan 1945. We have his dress jacket, with his sargent stripes, which was his last rank. $3.00 of the $20.00 goes to the 94th Assoc. My father, Elmo Urban, was in M Co., 376th Reg, 94th InfDiv. He was a machine gunner and arrived at the 94th on Jan 15, 1945. As a member of one of the MG platoons, I assume he was "attached" from time to time to the line companies (I,K&L). As many have stated in their searches, Dad rarely spoke about the war. He passed away in 1998 and I am trying to find anyone who might have known him and could relate what they all went through. I have several pictures of him with several others in a window of an SS barracks. my father, August Gabriel Napoli, was in the 94th infantry division. I believe he was wounded in March of 1945 in Germany, near Trier. my father passed away over 20 years ago. Hoped someone could help me find any records of my fathers activity during the war. Oor if there is anyone still around that may have known him. I'm looking for Charles Wayne Gergely. I last served with him in Ft. Campbell. I think he has been to New York and Hawaii. My email is mterry6675@blomand.net or spittinand drummin@hotmail.com. I was wondering if you have any information about Neall Kelsey. He was in the 94th Infantry Division during WWII. He was a medic and he was 32 years old when he entered the Army. He was from Grenloch, NJ. I am his daughter. Thank you for any info you have about his time in the war. Subject: Fredrick B. Chasse Jr.
To Mr. Harry Helms, Hi, My name is Joseph J. Tamberino Jr., I'm writing to you this morning, to see if you can help me find out about my Grandfather, Fredrick B. Chasse Jr. PVT. #31431789, who severed with the 54th Signal Battalion HQ. Co., 94th Infantry during WW II. My Grandfather had passed away last year, And yesterday was his Birthday, He would have been 90 years old. Being a Veteran myself, and who comes from a family of many Vets, My Grandfather would never talk about what he did, or where he was during WW II, as many hero's, only to say he was in the Battle Of The Bulge. Last week I bought the new DVD of the movie Patton, One of my favorites, and it has a special documentary in it about the 94th Infantry Division, as you probably know, In it, the 94th was not in the Battle Of The Bulge, but at the Sigfree line, Where Patton hung the 94th out to dry and sent his armor north to Bastone.I need your help if you can, to close this chapter in our family as to where he was, and where he got wounded. He did tell us that he was a part of Patton's 3rd Army. I've also enclosed a photo of his medals, very impressive. Also, On his DD 214, there is now mention of the Bronze Stars, only the Purple Heart. I would greatly appreciate any kind of help that you can give. My grandfather, Robert H. Carter, served in the 94th and was KIA Jan 16, 1945. His serial number was 31430827. I met his CO at a 94th reunion in St. Louis around 1992-93, can’t remember which year. My grandmother was able to find some peace with being able to speak to his former captain and garner details of her late husbands death. Anyway, I am quite interested to find out if there is anyone still around who knew my grandfather and could shed some more light on his service prior to his death in combat. I am currently serving on active duty in the United States Navy, stationed in Japan. I am trying to find information pertaining to the specific movements, and operations of my uncle's outfit during his service with the 94th Infantry. He was KIA on January 24 1945 somewhere in the Taben-Serrig position, and I am not sure, but from the information that I have been able to get, I was told that he and some more men were on patrol the night that he was killed. This is pretty much all that I know and I would greatly appreciate any help that you can lead me to as I would like to find out as much detail of the "day to day" envolvements as possible of Jesse and his buddies in the ETO. While moving my mother out of her house last year, I came across an interesting item. It is a wooden cigarette case. It appears handmade. On the front is the 94th Infantry Division insignia and around the insignia are the words "Our thanks to the American Army" at the top and "Czechoslovakia" underneath the insignia. All four sides have a texture to them and are stained. I assume for striking matches. Are you familiar with these items? My father was in the Navy in WWII, stationed in the Philippines, but he taught at a military school in Missouri for many years — Kemper Military School and Junior College. I would be willing to bet he got this from a member of the military department he worked with at Kemper. If you would like I could email a photo of the case. 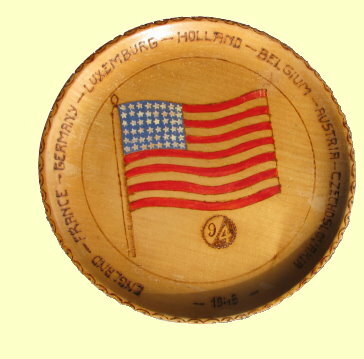 I am not sure if you can help but I have received a wooden plate as a gift with your unit insignia and your theaters of operation carved into it. I have attached a picture of it. It is well crafted, but there are no initials or names on the back; where I would have assumed a soldier might have signed his work. Neither is there any regimental or smaller unit identity, so am thinking rather than a unique piece it may be one of many used as presentation gifts. I am hoping someone there might recognize it and be able to provide some history on it. It is beautiful in its own right and I am happy to have it as part of my collection, but it would be that much more meaningful if I had some history on it. I would greatly appreciate whatever help anyone could provide. PS:I am looking forward to reading up on your unit on the website. It is with deepest sympathy that I notify you. My mother, Sarah Denk, went home to be with the Lord peacefully at her home on 11/17/08. She was the wife of Nicholas Denk who preceeded her in death in Feb 1, 1992. Sarah was actively involved with the Ladies Auxillary and even after daddy's death managed to travel to reunions held in different states. She will be deeply missed by so many family and friends. Mom was 94 years young. I am the daughter of Alfred Meidlinger who was also in the 94th Division, 301st Infantry, Company F. My father died in 2002, but never shared anything with any of his 8 children about the war as this was an awful experience for him and he didn't like to share the bad memories. I now have sons of my own and my 8th grader is finding himself increasingly more interested in my father and his war experience. I am writing in hopes that you may know if it is possible to find specific information on soldiers in the 94th Division or if there is anyone that may possibly remember him and have a story or two to share? I know that my father received a Bronze Star for bravery on the battlefield, but beyond that I'm sorry to say that I don't know much. I appreciate any help you can give me on this. I have recently acquired a small 94th Division pamphlet “On The Way”, which was printed in Paris. It has “PFC David Jackson” in “name” area and several signed names in the “autographs” area. They are Daniel Baugh, PFC Glenn Ames, Larry Halland and Al Wilcox. If anyone has any information on these soldiers I would appreciate it. My name is Elizabeth Johnson and I am searching for anyone with information about my uncle Pvt William “Pearl” Campbell who died on Feb 7, 1945. My mother, his sister, has very few details about his service and is now losing her ability to communicate what little she knows. My uncle, who was known as Pearl to his family, was only 19 when he died. I don’t know a company or location of his death even. I would appreciate any information at all. Thank you, not just for any help you can offer, but for your service. I am grateful for both. Good Morning, my name is Edward Dominguez I am also trying to locate photos, and account of how my grandfather served with the 94th 301. His name was “Alberto F. Guerrero ASN 38558709, KIA Feb 21, 1945. My father was SFC Harry Wyatt 35654999. He did not talk about his experience in the US Army with my mother, brother or me. Tonight I found a brief letter to my mother dated May 19, 1945. It was written on the back of a typed letter of Commendation to the 94th Infantry Division by Major General Walton H. Walker. My dad's return address was SFC Harry Wyatt 3565499 Hq. Co. 3 ?u.376 Inf ?PO94. In the lower left corner of the envelope it is stamped "passed by" then signed Lt Johnson. I would appreciate any information about him or the experiences of this group of soldiers. Thank you for serving and sacrificing for this United States of America. Dad died February 14, 2001 and was buried in Beckley, W.Va.
My father was a member of the 94th 302nd infantry L company. He is still alive living outside of Boston but never speaks of his time in the service. I know he was wounded and taken prisoner. Does anyone have any additional information? getting ready to go to Japan. He was a telephone man running lines. If any one remembers him please contact my grandmother at 518-962-4488, he would be so happy to hear from anyone. Anyone with a picture of Company D of the 376th Infantry Regiment, 94th Infantry Division in 1944-1945?